Is Cuba-North Korea Cooperation Good or Bad for U.S.? On November 22-24 North Korea’s Foreign Minister Ri Yong Ho was in Havana to meet with Cuba’s Foreign Minister Bruno Rodriguez and President Raúl Castro. Was this a positive or negative development for the U.S., which has simultaneous strained relationships with both countries? Since 1960, soon after the Cuban Revolution assumed control of the island’s government, Cuba and North Korea have had close diplomatic relations. It started with a 1960 visit to North Korea by Che Guevara, who praised the North Korean regime as a model for Cuba to follow. In 1986 Fidel Castro visited North Korea and met with the country’s founder, Kim Il-sung, and his son and successor, Kim Jong-il (the grandfather and father, respectively, of the current North Korean leader). In July 2013, a North Korea-flagged vessel was seized by Panamanian authorities carrying suspected missile-system components hidden under 10,000 tons of sugar bags upon its return from Cuba. Cuba claimed the weapons were going to North Korea for repairs and were to be sent back. However, the next year a United Nations panel of experts concluded that the shipment had violated sanctions placed on North Korea, although Cuban entities were not sanctioned in the aftermath despite protests from the U.S. In 2015, Cuba’s First Vice President and foreseeable successor to Raúl Castro, Miguel Díaz-Canel , was received by Kim Jong-un in the North Korean capital. In December 2016, a North Korean delegation to the funeral of Cuban leader Fidel Castro emphasized that the two nations should develop their relations “in all spheres” — a comment that was echoed by Raúl Castro, according to state media reports at the time. This year the Kim regime has been strengthening its ties with Cuba with a view to breaking its diplomatic isolation, before the tightening of sanctions imposed by the international community. 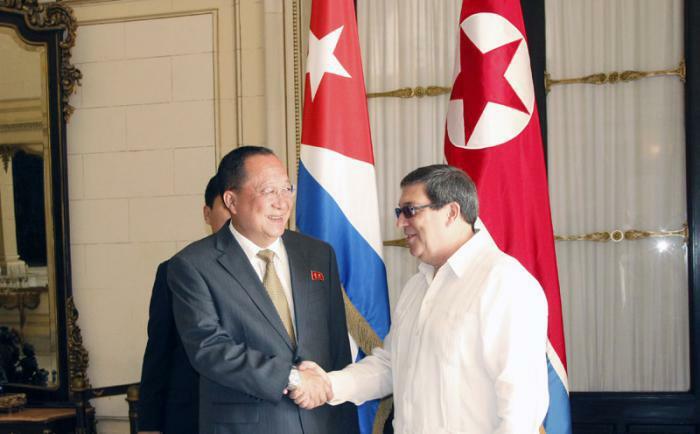 In January, Cuban Vice President Salvador Valdés Mesa received the number three of the North Korean regime, Choe Ryong-hae. In May the North Korean trade union leader Ju Yong-gil visited Havana as part of a meeting of the World Federation of Trade Unions and reportedly returned with a message of solidarity from President Raúl Castro. Ho’s first meeting in Cuba was with Foreign Minister Rodriguez and below is a photograph of the two men at that meeting. Canada had an interest in seeking such solutions, not just because of regional security but also because the flight path of possible North Korean missiles would pass over its territory, Trudeau said. Although this blog desperately hopes for a de-escalation of tensions between the U.S. and North Korea and the avoidance of a nuclear war, I doubt that Cuba or Canada via Cuba can make a significant contribution to that objective. Reuters, Castro Meets North Korean Minister Amid Hope Cuba Can Defuse Tensions, N.Y. Times (Nov. 24, 2017); The North Korean chancellor brings to Raúl Castro a ‘verbal message’ from Kim Jong-un, Diario de Cuba (Nov. 24, 2017); MacDonald, North Korea relations could be cooled using Cuba, Trudeau says, Global News (Nov. 23, 2017); Reuters, Cuba, North Korea Reject ‘Unilateral and Arbitrary U.S. Demands, N.Y. Times (Nov. 23, 2017); Cuba Foreign Ministry, The Cuban Foreign Minister met with his counterpart from the Democratic People’s Republic of Korea (Nov. 22, 2017); Gomez, Bruno Rodriguez receives Foreign Minister of the Democratic People’s Republic of Korea, Granma (Nov. 22, 2017); Reuters, North Korean Foreign Minister Heads to Cuba, N.Y. Times (Nov. 20, 2017); Taylor, Amid growing isolation, North Korea falls back on close ties with Cuba, Wash. Post (Nov. 17, 2017).